With each Tea Time, I like to pick a tea that’s noticeably different from the previous review. For example, after a lusciously bold and complex black tea last time, I decided to try an herbal blend next. I also was eager to revisit Bingley’s Tea’s Jane Austen Tea Series , since I fell in love with the first tea I sampled from them. So, out came my sample of Compassion For Mrs. Bennet’s Nerves. This blend of floral, mint, and fruit ingredients is inspired by the matriarch of the Bennet family in Jane Austen’s Pride And Prejudice. Frequently nervous and easy to upset, Mrs. Bennet (whose sole desire in life seems to be marrying off her daughters) would no doubt benefit from a warm, soothing beverage. Does Compassion do the trick? Read on to find out. Steeping Instructions: Use 1 to 1½ teaspoons per brew. Heat water to boiling (212 degrees Fahrenheit / 100 degrees Celsius) and steep for 5 to 6 minutes. One whiff of Compassion For Mrs. Bennet’s Nerves and – whoa! The fragrance punches its way out of the package with equal parts fresh, zesty peppermint and sweet, mellow chamomile. Maybe there’s a trace of fruit in there… but it’s hard to tell. Either way, the strength of this tea’s aroma shocked me. It’s invigorating enough to perk your eyes open. Which isn’t such a bad thing; it’s just not what I had expected. For my first cup of Compassion For Mrs. Bennet’s Nerves, I brew 1 teaspoon with boiling water for 5 minutes. Out comes a honey-colored infusion that oozes the refreshing qualities of its two main herbs. Imagine a river of chamomile with the bite of peppermint flowing over your tongue. That’s pretty much what Compassion is like. This tea also finishes with a medium astringency that catches me by surprise. Each sip leaves a little dryness on my tongue and causes my cheeks to pucker slightly, especially as the liquid goes down my throat. Most herbal teas don’t have this effect on the drinker, and in my opinion it somewhat defeats the purpose of Compassion. Experimenting with longer brew times and more dry “leaves” (1½ teaspoons) doesn’t change the experience with Compassion. Each cup blooms with bright yet somewhat sharp contrast. For this reason, I’m not sure whether I’d call this a “relaxing” tea. The peppermint acts like a stimulant, overriding any calmness the chamomile would provide. So, instead of feeling relaxed, I feel awake – not in a caffeine- or spice-induced manner, but in a pleasantly natural way. This herbal is therefore a better choice for an afternoon pick-me-up instead of a nighttime wind-down. My only other comment about Compassion For Mrs. Bennet’s Nerves is that its clean-up can test a tea drinker’s patience. The wet ingredients clump together and create a thick, fuzzy carpet at the bottom of my infuser. (In case you’re wondering, I use Teavana’s Perfect Tea Maker for a western-method brewing.) I’m not sure whether the chamomile or the lavender causes this, but it takes a thorough wash and rinse to get everything out. Compassion For Mrs. Bennet’s Nerves certainly has a unique flavor profile compared to other herbal teas. It carries both minty and floral sweetness, as well as a liveliness I wasn’t expecting from a tisane that’s advertised as calming. Also, while I like both chamomile and peppermint teas, I’m still not sure how I feel about both ingredients in one cup together. The keen contrasts between their flavors and the resulting astringency didn’t appeal to me as much as either tea solo. Fans of mint-based tisanes will most likely savor this more than chamomile aficianados would. For me personally, I’d drink Compassion it if someone served it to me, but it’s not something I’d keep in my personal stash. Possible Book Pairings: Apart from Pride And Prejudice, try Compassion For Mrs. Bennet’s Nerves with Phillip Pullman’s Dark Materials Trilogy (children’s / YA fantasy) or Frances Hodgson Burnett’s The Secret Garden (fiction). 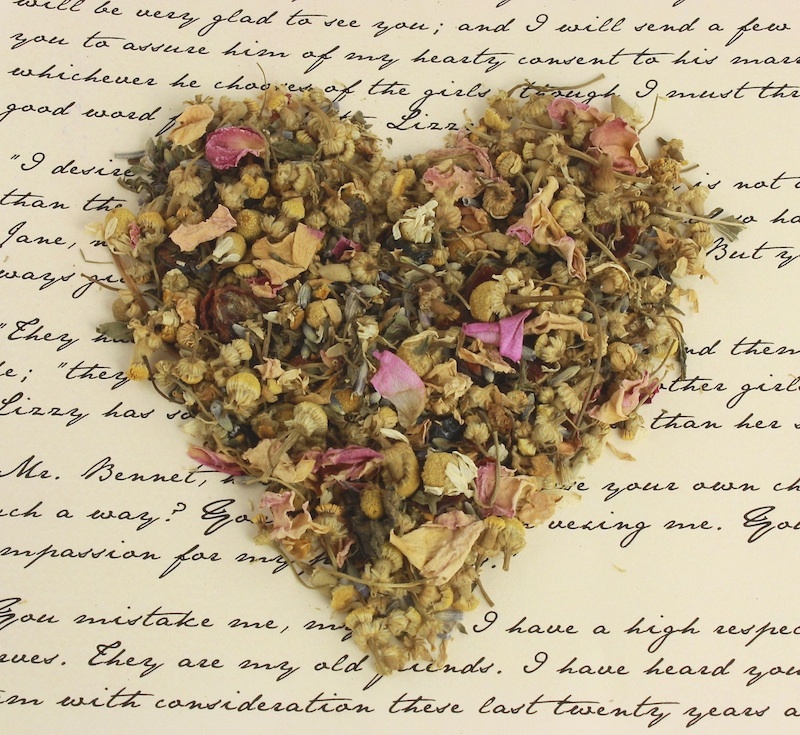 You can purchase Compassion For Mrs. Bennet’s Nerves directly from Bingley’s Teas here. Next Post UPDATED INFORMATION on new Anne Rice Scholarly Compendium-Seeking Submissions! Herbal teas are well-known for their medicinal, soothing qualities. 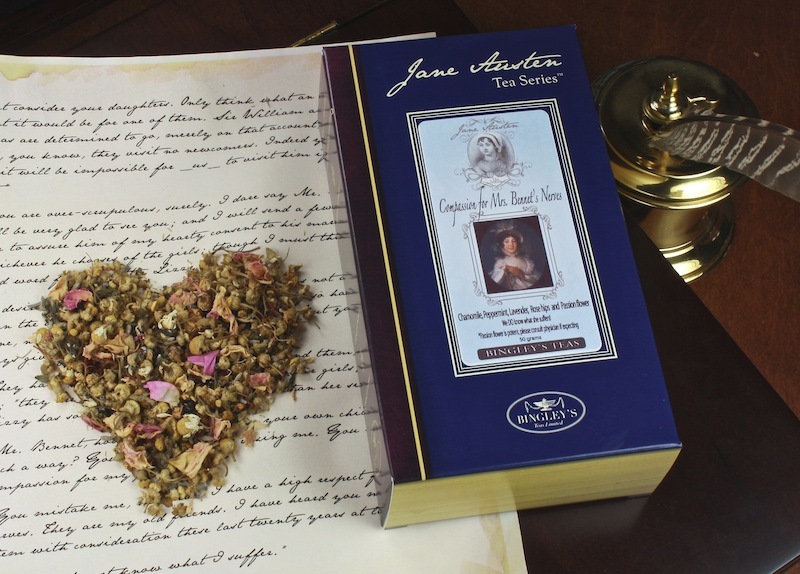 Compassion For Mrs. Bennet’s Nerves, part of the Jane Austen Tea Series by Bingley’s Teas, combines sweet, mellow chamomile with stimulating peppermint and other ingredients to offer a panacea to the excitable, melodramatic matriarch of Pride And Prejudice’s Bennet family. The question is, does it do the trick? Find out by reading my review now at A Bibliophile’s Reverie! Thanks very much for commenting, Temptress / Bingley’s – and for clarifying a few things, too. I do remember the note about using honey from the site description. But I’m so used to drinking my teas straight (without milk or sweeteners) that I didn’t think to try it. I’ll make a point to do so next time around. You also make a good point about this sample having a larger amount of peppermint than the other ingredients. I’ve noticed similar “imbalances” before with other herbal teas or tea blends. Sometimes you don’t know how much of each ingredient you’ll get each time – which can result in differently smelling and tasting brews each time. Again, another thing I should consider next time around. Also, we do recommend using the compost happy tea sacs when steeping this herbal. Much easier clean up! ;).